This mod takes my Calvus and Rerlas companion mod, changes Calvus to female, and updates the dialogue accordingly. 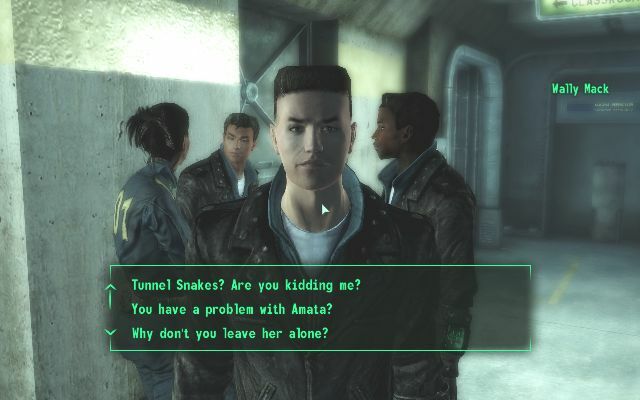 While most of the dialogue in Fallout 3 is perfectly fine and some is downright excellent, there were some player-lines in the game that led me and other players to … well, cringe a bit. The worst offender is a certain line to Three Dog, but there’s a key scene in the main quest where you can see why they did it the way they did but it doesn’t really make sense in immersive terms. 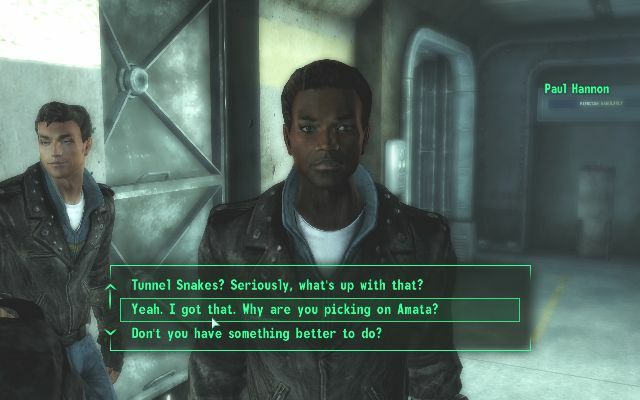 This mod generally avoids changing response text (lines spoken by NPCs – which are generally fine anyway) although one or two typos have been fixed. Not every conversation has been altered – far from it – but just a few areas where I thought the player’s own lines could be improved have been changed. The Less Generic NPC project, or LGNPC for short is a mod that aims to replace all the repetitive Morrowind dialogue with more interesting and engaging conversations. We want each NPC in every town, village, or camp to have his or her own personality and back story. We have decided to approach this mod town by town, and release each one when it is finished. We hope to ultimately replace the dialogue for every NPC on Vvardenfell, and so far we have completed six towns and a big city. The big city we are talking about is Ald’ruhn, the main headquarters of House Redoran. It is actually the largest single mod we will release, since we are going to do Vivec one canton at a time. This plugin is the biggest Morrowind dialogue mod ever released, containing over 3000 responses for 250 topics, which is equivalent to more than 500 MSWord pages. Moreover, it has 30 quests for you to enjoy. To learn more about its other features, visit the downloads page and get the mod, which is packed into a small 250KB archive, not being a problem for the slowest connections out there. Our latest mod, Tel Mora, is much less fluffy than Pelagiad, as you might expect from a lonely Telvanni settlement on a wind-swept coast. This time around you’re even more likely to encounter… not very sane people, but can you blame them living in a women-only town? We have aimed to preserve the Morrowind dialogue feel with each of our NPCs, so you can rest assured none of them will tell you their new DVD player is cool. We plan to release merged mods for each region when it is done, and eventually a single mod for all of Vvardenfell. Many NPCs in the towns we replaced now have branching dialogue, as well as completely unique responses to countless topics. Any NPC that is part of a quest still functions as before, but has unique dialogue. For example, you can still rescue Madura for the Imperial Legion despite the Ald Velothi mod, and you can still get quests from the new Neminda in the Ald’ruhn mod. Many NPCs also have quests attached. We do not like over-powering rewards, so some of those include healing scrolls, jewelry, a small house in Maar Gan, alchemy knowledge, reputation, and miscellaneous artifacts, all balanced with the quests they are gained from. In addition to that, some new quests are intertwined with the old ones, and of course the old ones are always taken into account when each NPC is written. The LGNPC Series was inspired by the original Less Generic NPC Project: Seyda Neen, created by Joe Stevens. Adds modern ‘companion’ functions based on Grumpy et al’s scripts to Calvus Horatius (the companion in Tribunal), plus warping to the pets sold by Rerlas in the Great Bazaar in Mournhold. Calvus has more functions, more features and more personality. The pets can be retrieved if lost and resurrected if killed. Also, there is a chance the player may become House Indoril Hortator, and/or earn a title of Morrowind Nobility.